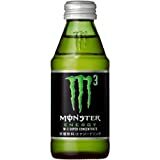 These drinks did have a higher concentration of caffeine than standard Monster but have since been lowered. The old caffeine content was 180 mg per can. Monster Maxx contains 8.42 mgs of caffeine per fluid ounce (28.46mg/100 ml).